I have dragged my feet too long now on introducing this latest converter. I am choosing to call it the AA converter for hopefully obvious and helpful reasons. The converter is designed to function with an input voltage of ~ .8V up to the Vf of the LED or 4.5 V max. Basically this means it will work on one of my lights using either the single AA pak, 2xAA pak or the 1x123 pak provided the right battery is used. The primary goal was for it to function on any flavor of single AA battery one might have on hand; alkaline, nickel-MH, lithium or what have you. A CR123 primary is fine. A Li-Ion will work but any voltage over the Vf of the LED will be clipped and wasted as heat. The converter is a three level converter with the same method of level change used in the 3S converter as well as the 6V buck 3 speed converter I have been building with. The output (constant current) from this converter is 15, 45 and 300 mA (low - high). On a test mule with XM-L LED using this converter and a AA Alkaline battery I measured lumens of 2,10 and 85 (low - high). This converter is a double sided PCB in the same physical package as the other converters and it goes in the same light engine package I have been using. Consequently the possible variations of battery pak and head that this new converter can be a part of is just more confusion for all of us! As for possible battery pak to be used with a AA light, all but the 2x123 pak (3rd from left) in the pic below are viable. As for heads, the light engine can be used in a Mule, SunDrop, Haiku or even Makai head. Either the Nichia 119 or Cree XM-L LED can be coupled with this converter. 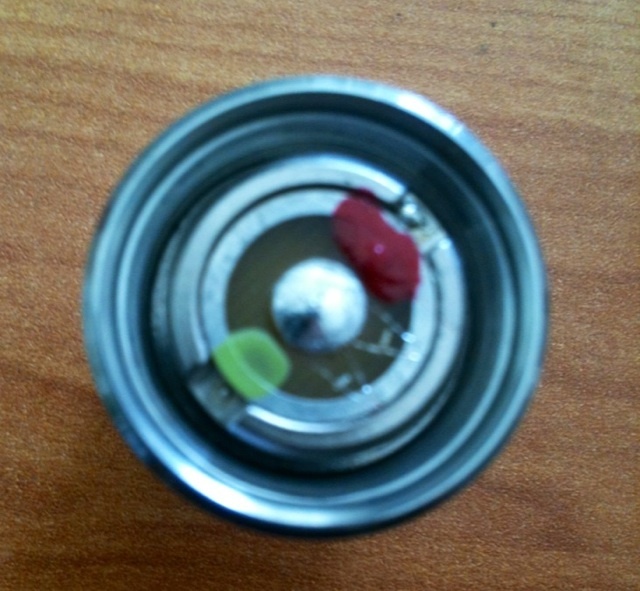 In the pic below, from L to R are an AA Mule, Haiku 1x123, AA Sundrop and then an AA Haiku. You can see that at one point the converter dropped out of regulation for a moment and then attempted to continue on, only to drop down again to the low level. What I didn't record was the fact that this ran for quite a while before I checked on it. I turned the light off and when I turned it back on, it came on in high again and held for a while. With intermittent use and various levels selected, I think you can get a good amount of light from a single AA battery. As far as pricing goes, the AA converter cost is the same as the 3S converter and the single AA pak is the same cost as the 1x123 pak is. I fear I am inviting confusion by calling the converter an AA converter as well as using the designation for the single AA pak as an an AA pak. As for anyone wanting to order one of these lights, please refer to my "How to order and Policy" thread. 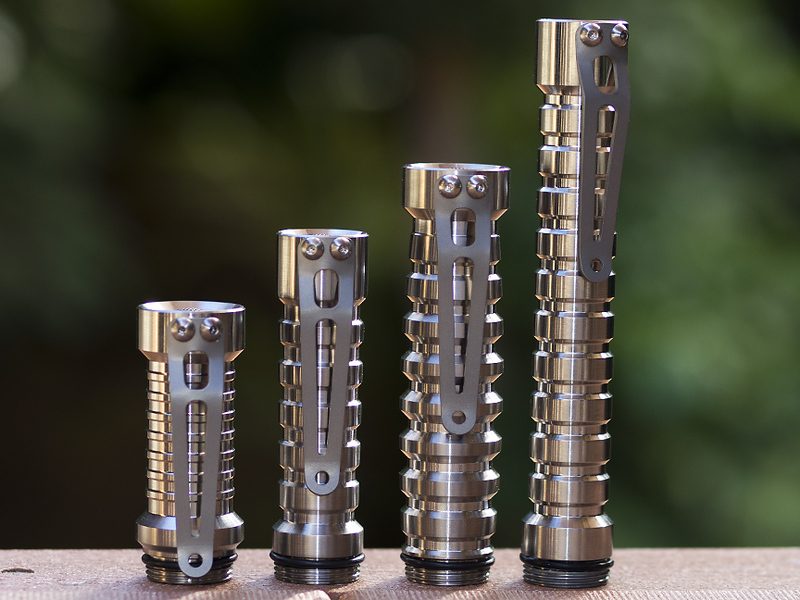 I should add that of course you can request the 1/4' x 20 tapped pocket clip for an additional $5 on any of these. I built myself two Mule AA's, one Hi CRI and the other with the XM-L and added the 14-20 clip. I really like these lights as I see them bridging the gap between the sapphire and the higher powered lights. Lastly and really off the subject at hand, I want to thank you guys for putting up with me and my offerings these years! Some CPF members have been complaining for years that there were too few custom AA lights. This is sure to make them happy! Way to go Don! Very cool! I may be in for another LE soon. Congrats Don. Can't wait to get my hands on them. It really opens up new possibilities with the range of voltage that it handles. These are surely going to bleed those primary dry. Not to mention the versatility of AA availability world wide. Now even my grandma can use it. And you can have your choice in any of the heads and emitters too. Last edited by BenChiew; 04-23-2013 at 09:46 PM. i look forward to getting one or two of these AA lights. I think one observation may be worth pointing out here. The Nichia HiCRI has been at a disadvantage in my other lights compared to the Cree LED's by virtue of its lower current capacity. With the AA converter and a max current of 300 mA, the Nichia is on a much more even footing. It still can't compete with the efficacy of the Cree but the quality of light goes to the Nichia and for throw and a clean beam pattern, the Haiku AA with Nichia is a sleeper in my opinion. Am I correct that a Mule High CRI head with AA LE is $235? I am curious as to the efficiency of this driver versus the previous standard "3V" driver .... In other words, if one is planning to primarily use a 3V or 4.2V power source, is there any reason to prefer the older version ? Yes you are correct, $235 plus postage for a Mule AA HiC head. I don't know what the efficiency of this driver is compared to the original 3S converter is. Since the 3S is a buck/boost it may not be as efficient. However Like I tried to explain above, if your input voltage is above the Vf of the LED and presumably some overhead, the excess voltage is wasted as heat. I guess this converter acts as a current limiter at that point as opposed to the more efficient buck of the 3S. 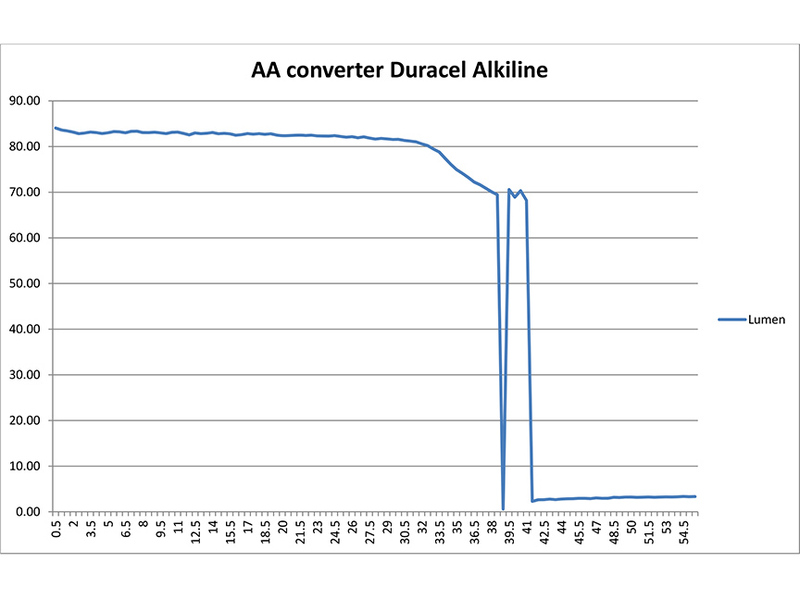 The other consideration is that the 3S converter drives the LED on high at a higher current level than this AA does. All told, If someone is planning on using 3V or certainly 4.2V power source only, I see no advantage to this AA converter. For power sources 3V and below it's a different story. I like the current-controlled lower output modes, and the lower voltage range, of this driver .... Understandable that there may be trade-offs, though, at the higher voltage. So, speaking in terms a guy like me can understand, if I were to purchase a AA Haiku Hi CRI with a 1 AA pak ($450), I could replace the AA body with a 1x123 pak with a SF123 and it would work just as well? If so, does your assistant work on the weekend and does he (she, it??) do the packing too? Yes, you can put the AA head on a 1x123 pak and use a primary like the SF123, no problem. And no, the lizard doesn't but I do. Well, it's been too long since I last said this, but get one ready, I'm sending you an email momentarily. I was thinking about ordering a light with the Hi CRI LED and this is just what the doctor ordered. One Haiku AA Hi CRI - $450, please!!! Now Don I'm pretty sure that Liza is the boss/supervisor not you! Congratulations on bringing this project to fruition Don. I asked previously, no BB on those 1xAA Paks, but I hope Don changes his mind. Those BB are just beautiful. The AA LE is clearly marked as AA with 2 other nail polish markings. One is green and the other is red. Comparing the the AA XML beam with the 3S XML beam, one can barely see the lumens difference. On low and medium, I could see that the 3s is a touch brighter. On the high the difference is much lesser. AA brings new frontiers in battery choices and at the same time, the LE happily takes a 3.2V CR123. In a pinch, you could also get light with a single 4.2v rechargeable setup. If you have e series lights with you, this LE will compliment your arsenal. I decided on the Haiku XML as my first McGizmo light, but Don's comment still intrigues me. I've used LiFePO4 cells before to deliver 3 V - they don't have the capacity of an ICR. I would prefer using a 123 pak to using a 2 X AA pak with Eneloops. ...but the quality of light goes to the Nichia and for throw and a clean beam pattern, the Haiku AA with Nichia is a sleeper in my opinion. Yoyoman. You can't go wrong with the efficient XML. It is not advisable to use a LiFePo4 with the AA LE. It will turn your rechargeable into a non rechargeable. The LE is capable of handling the upper limits of the 3.2-3.3 volts of the LiFePO4. And it will continue to draw on it till it is 0.8volts, by which that battery would be damaged and killed. Benchiew, similar to my idea with the MD M31? At least I'm consistent. You are right, the Malkoff M31 will also bleed your LiFePO4 battery dry beyond the limits of the battery. I just did a runtime on one fully charged AA eneloop on high. I got just under 2 hours before stepping down. Impressive. for throw and a clean beam pattern, the Haiku AA with Nichia is a sleeper in my opinion. Well, it certainly woke me up!! It's my new favorite. 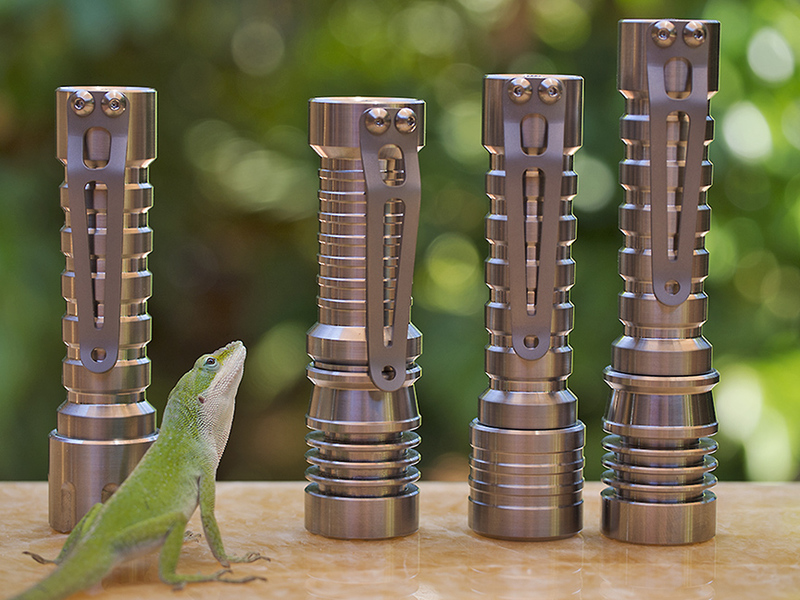 Email sent last night for a few (and one other item) for the family with the Nichia. (By the way, my CPF "handle" is "ajl" not "alangloi" as I mentioned in the email.) Regards from Jacksonville. Wow. Congrats. Buying a few and sharing it with family. Don has got a winner here. This is great news and will be a perfect match to the AA battery pak. 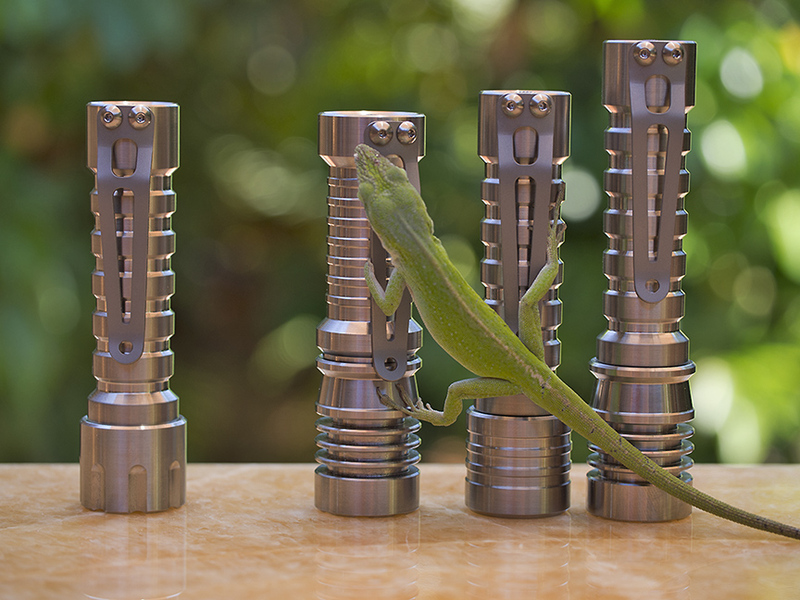 Can you let us know if LE with this new converter are available separately for easy upgrades and if yes, the cost of the different versions (xm-l, high cri...) ? I think there are only a handful of people that have previously bought the single AA pak. As such, I think Don sees no need to list the head and LE option separately but if you go with his previous selling patterns, I am pretty certain that route is available to you.